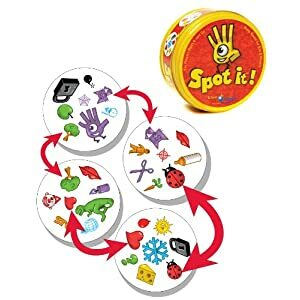 Spot it is an ideal kids travel game, in fact it is a great game for the whole family. This is the travel size version of the game, that comes contained in a tin. The idea is to spot two matching symbols on any of the 55 cards. Each card has 8 symbols of varying sizes. As another reveiwer said "It is exciting to spot the match, frustrating to know there is a match which one cannot see, and disappointing when one is beaten to the punch"
There are 4 versions of the game to play and the game play is around 10 to 20 minutes. It is great that 2 to 8 players can play the game, ideal for a couple of kids or a family. This is a really quick game to learn, fast to set up and put away and is fast paced so you can have a game if you have a spare 10 minutes or so. It seems to easy but don't be deceived, some of the matches are really difficult to find especially when you just know that the match is there somewhere. As well as being FUN FUN FUN Spot it. helps to develop cognitive skills by helping children to develop better visual perception, and matching skills as well as encouraging quick thinking and recall. Although this has a recommended age range of 6 and above, many children of 4 and above will probably catch on to it quickly. much fun and laughter for everyone to be had with this kids travel game. Our family highly recommend it, it is well worth the $11.94. the game can be slowed down to allow for extra processing time for those who need it as well. Best Toddler Toys:Toys for development, bathtime, gross motor skill development, climbing, and cognitive development.